Loved by grassroots followers, rejected by his own party's lawmakers and deemed by the opposition as a threat to the nation, Jeremy Corbyn is a socialist stalwart who divides opinion across the UK. London: He is adored by grassroots Labour followers, rejected by many of the party's lawmakers and branded by the conservative tabloid press as a threat to the nation. Today, Jeremy Corbyn's future -- and possibly that of the venerable Labour Party itself -- will be determined by one of Britain's most extraordinary elections. With many voters originally deeming him weak and doubting his ability to handle the task of leaving the European Union, Corbyn was handed a gift by the fickle gods of politics. A misstep by May over her policy for funding care for the elderly -- a "dementia tax," as the media called it -- let him cast her as cold and uncaring. Relaxed and tie-less, he scored gains in the crucial arena of television, coming across as an amiable underdog making a principled stand for society's poorest. Then, after terrorist attacks in London and Manchester killed dozens of people, Corbyn went on the offensive over May's six-year past as interior minister, when thousands of police were axed from the payroll. Opinion polls that initially predicted a Labour Party wipeout now see May winning a relatively slim majority, or even no overall majority at all. Both outcomes could see Corbyn stay at his party's helm, to the consternation of critics who mutter that this would doom Labour to the twilight of perpetual opposition. But Corbyn is no stranger to upsetting the odds. In 2015, with Labour in disarray after an unexpected election defeat, Corbyn's tilt for the party leadership was widely dismissed as hopeless. Instead, he swept to a stunning landslide victory through the support of leftist grassroots followers. The battlefield experience may well have helped Corbyn, suggests Tim Bale, a professor at Queen Mary University of London. 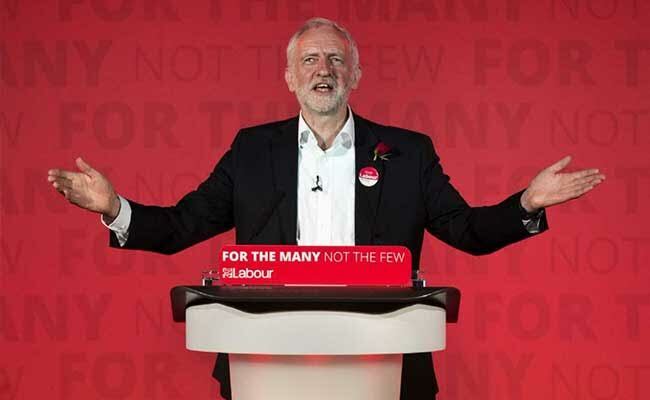 "Corbyn has fought and won two leadership campaigns in two years, seems to have benefited from that experience and is at least authentic rather than, like Mrs May, robotic," Bale told AFP. To the conservative tabloids, Corbyn is an easy bogeyman -- in their eyes, a symbol of Britain's 1970s decline, of vapid radical posturing. His past utterances have been hauled out for present-day scrutiny, not least his position on security in the wake of the terror attacks. On election eve, for example, The Sun referred to a speech Corbyn had made at a pro-Palestinian rally in Trafalgar Square, before "Jezza's Jihadi Comrades." It was in 2002. For such critics, Corbyn is a classic protest politician who finds it easier to agitate than to take up the messy business of exercising power. Corbyn hails from an impeccable socialist background -- his parents met as activists in Britain during the Spanish Civil War -- and he worked for trade unions before being elected MP for Islington, a leftwing stronghold, in 1983. He never took on ministerial duties during Labour's 1997-2010 spell in power. Instead, he remained on the backbenches, championing human rights, leftist and anti-war causes. He often rebelled against the party line, endearing himself to young voters sickened by the compromises of mainstream politics. Bearded and teetotal, he dislikes wearing a tie, does not own a car and prefers to cycle, porridge-fuelled. His hobbies include making jam, allotment gardening and photographing manhole covers. His third wife Laura Alvarez is 20 years his junior and runs a company importing coffee from her native Mexico. They have a cat named El Gato -- Spanish for "the cat", which he sardonically claims has "socialist tendencies" as it shares its food with the neighbours' feline. Despite his enduring appeal to the leftwing faithful, Corbyn has had to moderate his views for the Labour election manifesto. Britain would therefore retain its monarchy, nuclear deterrent, NATO membership and private retail banks under a Labour government. But if he makes it into Downing Street, Corbyn insists he will not give up his cherished allotment. "You do your job better if you give yourself time to collect your thoughts and do something else," he said.